Goodreads: Sometimes the only way through darkness is to return to where it began. Marianne Stokes fled England at seventeen, spiraling into the manic depression that would become her shadow. She left behind secrets, memories, and tragedy: one teen dead, and her first love, Gabriel, badly injured. Three decades later she’s finally found peace in the North Carolina recording studio she runs with her husband, Darius, and her almost-daughter, Jade…until another fatality propels her back across the ocean to confront the long-buried past. In her picturesque childhood village, the first person she meets is the last person she wants to see again: Gabriel. Now the village vicar, he takes her in without question, and ripples ofwhat if reverberate through both their hearts. As Marianne’s mind unravels, Jade and Darius track her down. Tempers clash when everyone tries to help, but only by finding the courage to face her illness can Marianne heal herself and her offbeat family. Kritters Thoughts: First let me say that I have not had much personal history with depression in my immediate circle of friends and family, so I am somewhat naive to mental illnesses, but I do believe that if something is broken you do what it takes to get it fixed - from a broken toe to a broken brain. I went into this book after reading the synopsis thinking that Marianne had healed from her depression and was excited to read a book about the after of mental illness, this was not the case. When Marianne returns to England it may be to heal, but she is far from a place of recovery. This fact made the book a hard read for me. It was hard to read her mania, especially before she makes an effort to move towards find a place of peace. I absolutely adored hearing from her daughter Jade. To hear how mental illness affects the whole family was both heart breaking and interesting for me. I loved that Marianne could use Jade as a reason to fight to find a place of healing. Jade stood out for me as the character that made this book worth reading. I am not sure that this is my favorite book from this author, but it definitely won't keep me from reading her next. 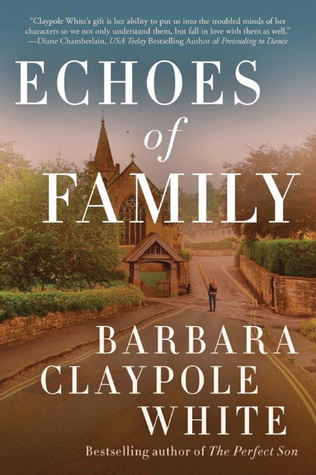 I loved her book The Unfinished Garden, so try that one next if this is your first Barbara Claypole White experience. Disclosure of Material Connection: I received one copy of this book free of charge from TLC Tours. I was not required to write a positive review in exchange for receipt of the book; rather, the opinions expressed in this review are my own. Thanks so much for reading and reviewing. Yes, I love Jade too. I have people close to me who suffer from mental illness and no matter how hard I try I just cannot understand what they're going through. Books like this can really help with that in my opinion. Thanks for being a part of the tour! You can subscirbe to our feeds trough RSS or trough mail. Thanks! Blogger Template by Beta Templates.